My daughters are gearing up for their first ever lemonade sale, so I decided to whip them up a cute little booth to make it all very official. I originally had an elaborate plan involving appliqued letters with a hand-embroidered outline planned, but thankfully my friend Cydney talked me into stenciling with paint instead. While I often work alone into the wee hours of the night prepping for TV segments, it was super fun and way less stressful to collaborate on this project. And the best part is that my kids LOVE their new lemonade stand. Read on for instructions to make your own. Step 2: Cut a piece of freezer paper 9″ x 58″. Draw out the word “Lemonade” in block letters with a pencil on the paper side of freezer paper and cut out the letter shapes that you want to paint. Set aside cutouts from the letters “O”, “A” and “D”. Step 3: Iron the freezer paper shiny side down to your fabric using the top stitch line as a guide. Iron on the cutouts from the O”, “A” and “D”. 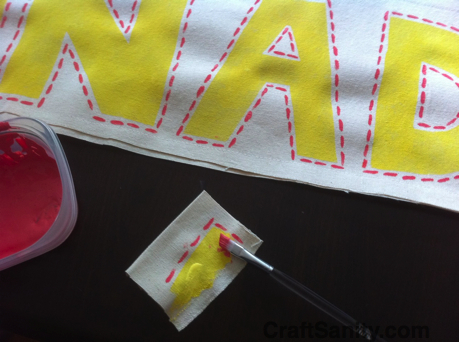 Step 4: Grab your stenciling brush and blot yellow paint onto the fabric to color in all the letters. Take a short break and let the paint dry. Step 5: Peal off the stencil and use pink fabric paint and a detail brush to make a dotted line around each letter. Let dry. Step 6: Put the banner on the top piece of PVC pipe and secure in place by adding the “elbow” connector pieces to each end. Add the side pieces of PVC and connect to base. (You can glue the pieces together, but we decided not to because we want our stand to easily break down for storage.) Position table under the banner, make lemonade, set your price (We’re going with 50 cents. ), grab some cups, and you’re ready to open your stand. Check out the video clip of our lemonade stand below on WZZM Channel 13’s “Take Five” show and be sure to post a link to your handmade lemonade stand. I’d love to check it out. Pretty part of content. I just stumbled upon your website and in accession capital to claim that I get actually enjoyed account your blog posts. Anyway I will be subscribing on your feeds or even I fulfillment you access persistently rapidly. This website is known as a stroll-by way of for all of the info you needed about this and didn’t know who to ask. Glimpse here, and you’ll undoubtedly discover it. Thanks for your entire work on this website. Debby enjoys managing investigation and it is simple to grasp why. My partner and i know all regarding the dynamic form you deliver functional techniques on the web blog and even cause response from some other people on the subject plus our favorite child is undoubtedly becoming educated a great deal. Take advantage of the remaining portion of the year. You are doing a very good job.